The premise of Color Me Kubrick: A True…ish Story is delicious: John Malkovich plays Alan Conway, a con artist who goes around London pretending to be the famed director Stanley Kubrick, known for 2001: A Space Odyssey, A Clockwork Orange, The Shining, and others. Conway knows little to nothing about Kubrick’s films, but because Kubrick hated publicity and refused to give interviews, few people knew what he looked like, aiding Conway in his deceptions. Celebrity is the other crutch Conway leans on: people love knowing someone famous (especially when that person promises to put them in his next film). I had high expectations of this film after learning that the story is based on the real-life misadventures of a Brit who decided that saying he was Stanley Kubrick would be more interesting than being himself. I also liked knowing that the screenplay and film were written and directed by people who worked closely with Kubrick on his films. Unfortunately, all of these elements fail to deliver the clever film they promise. It’s amusing to see how easy it is for Conway to con people around him: he dons the contemporary auteur costume (tee shirt, blazer, baseball cap), drops names, and even fraudulently guarantees a loan (he tells an ambitious but indebted restaurateur played by Richard E. Grant that together, in a year, they will be “opening wine bars in Paris, France”). Conway was so successful in these ploys that the real Stanley Kubrick received calls about debts and lovers that his impostor had left in his wake. But his success comes from sources other than his knowledge of his alterego’s true accomplishments. When quizzed by a woman about whether she would know any of the actors he has worked with, he fails to impress her when he can only come up with names like “James Mason, Ava Gardner, Annette Funicello” (that last name provokes one set of raised eyebrows at the table). “That’s amazing,” the young man replies, “really amazing. Because Judgment at Nuremberg was directed by Stanley Kramer, not Stanley Kubrick.” With that, he advises the impersonator to do his research before trying to pretend he’s someone he’s not. Celebrity: The Spice of Life? There are many parallels between Color Me Kubrick and the 1993 film Six Degrees of Separation. Both address the way people use celebrity to get what they want, as Will Smith’s character does when he claims to be the son of Sidney Poitier, and as Conway does when he gets countless free taxi rides, drinks, extravagant lodgings, and invitations to parties just because people want so desperately to believe they are being befriended by a famous person. These films also illustrate the ways in which people seek out opportunities to add glamour to their own lives: in Six Degrees, the rich art dealer Flan Kittredge and his wife Ouisa Kittredge (Donald Sutherland and Stockard Channing) invite the young, articulate con man to stay the night at their New York penthouse, and in Color Me Kubrick, cabaret singer Lee Pratt extends lavish hospitality toward “Stan the Man” in the belief that the latter is going to help make him a star in Las Vegas. Six Degrees goes farther, however, in showing how being conned adds spice to people’s humdrum lives: to the Kittredges, having a surprising story to tell their friends at dinner parties outweighs the embarrassment of having been conned. In Kubrick, no one wants to help build a case against Conway because it is too humiliating to admit they’ve been taken for a ride. Conway gets to keep on faking it until then-New York Times drama critic Frank Rich (William Hootkins) has a chance encounter with him at a London restaurant and starts to tug at the threads that expose Conway for the scam artist he truly is. The first half hour of the film delighted me: I giggled and gasped at Conway’s audacity and his targets’ gullibility. In one early scene, he explains to a couple he has invited over for dinner why he calls himself Alan Conway when he is really Stanley Kubrick: “I suppose at times I grow quite disgusted by the razzle-dazzle noise and glitz of showbiz. And at times I must concentrate on what is truly important in my life: my work.” But here as in other scenes, it quickly becomes apparent that it is not Conway’s skill at impersonation that helps him succeed but rather people’s strong desires to believe they are in the presence of someone famous, making his character’s portrayal less intriguing than it could have been. Farther into the film, Malkovich-as-Conway-as-Kubrick sometimes affects three or four different accents in a single speech. 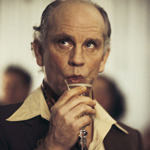 In one recent interview, Malkovich said this was a deliberate choice based on his understanding of the real Conway’s methods, but when I was watching the film it just looked like bad acting. The character’s campy costumes, schemes, and dramatic pleas for attention become repetitive and tedious. The end of the film finds him luxuriating at a ritzy rehab center (“I’ve read about the Rimini Clinic, in one of those magazines I bought at the supermarket. That’s where all the famous people go to dry out!”), thanks to his ability to con the psychiatrist at the mental institution. Unfortunately, that sums up the film itself all too well.